Jet Airways was once at the forefront of India’s rapidly growing market for air travel, but a challenge from budget carriers and surging fuel prices are backing the airline into a corner. The stock ended at its lowest level since June 2015 as the carrier’s finances deteriorated. Jet Airways, a substantial Boeing customer, was once at the forefront of India’s rapidly growing market for air travel, but a challenge from budget carriers and surging fuel prices are backing the airline into a corner. Shares of the carrier, part-owned by Etihad Airways PJSC, plunged 8.5 percent Friday in Mumbai after the company postponed announcing its first-quarter earnings. That’s less than a week after denying a report it needs drastic measures to cut costs and bolster its finances. The stock ended at its lowest level since June 2015 as the carrier’s finances deteriorated and the default risk on its debt obligations increased. Budget airlines such as IndiGo, GoAir and SpiceJet expanded exponentially in the past decade, giving first-time flyers a new opportunity and middle-class families an alternative to full-service carriers that offered lounges and free meals on board. India, the world’s fastest-growing major aviation market, is also one of the toughest in which to survive, with premium carrier Kingfisher Airlines collapsing and legacy Air India needing repeated state bailouts as ultra-low fares fail to cover their costs. In June, the airline agreed to buy 150 of Boeing’s 737 Max aircraft, which according to data from aircraft valuation firm Avitas are worth about $7.8 billion after standard discounts. Along with a 2013 order for 75 MAXs, that takes its backlog for the narrowbody jet to 225 airplanes, worth an Avitas-estimated $11.7 billion. A dozen years ago, Jet placed a separate order for 10 Dreamliner 787s. Although that order remains technically on the books, it’s doubtful if the airline will take these as it reviews its network. It has 121 planes in its fleet, according to its website. India is one of the toughest markets, where airlines are forced to sell tickets at base prices of as low as 1 rupee (2 cents) to attract the fastest growing middle class in the world. Kingfisher Airlines, started by Indian tycoon Vijay Mallya in 2005, was one of the nation’s leading carriers until it was grounded in 2012 amid mounting debt. Indian airlines are among the biggest customers for the single-aisle planes made by both Airbus and Boeing. Mumbai-based Jet Airways had total debt of $1.4 billion, and cash and equivalents barely 3 percent of that, for the year ended March 31, 2018, according to Bloomberg-compiled data. The firm’s total debt ballooned to 55.4 times earnings before interest and tax as of March 31, compared with 4.9 times the previous year, the data showed. In a brief statement late Thursday night, the company — with a market value of $464 million — said the audit committee didn’t recommend the results for the board’s approval, “pending closure of certain matters.” The company slipped into a loss in the year ended March following two years of profit. The BSE issued a statement Friday seeking full disclosure from the carrier to meet compliance rules. The company’s management and auditors needed more time to finalize its accounts, and the board “readily agreed” to it, Jet said in a statement Friday. The finalized accounts will be presented to the company’s audit committee at a later stage, it said without providing a timeframe. The probability of the airline failing to repay its obligations in the next 12 months is near the highest since October 2015, according to a Bloomberg Default Risk model, which tracks metrics including share price, debt and cash flow. SpiceJet’s risk is the most elevated since last February, and the gauge is little changed for IndiGo, the nation’s biggest airline. 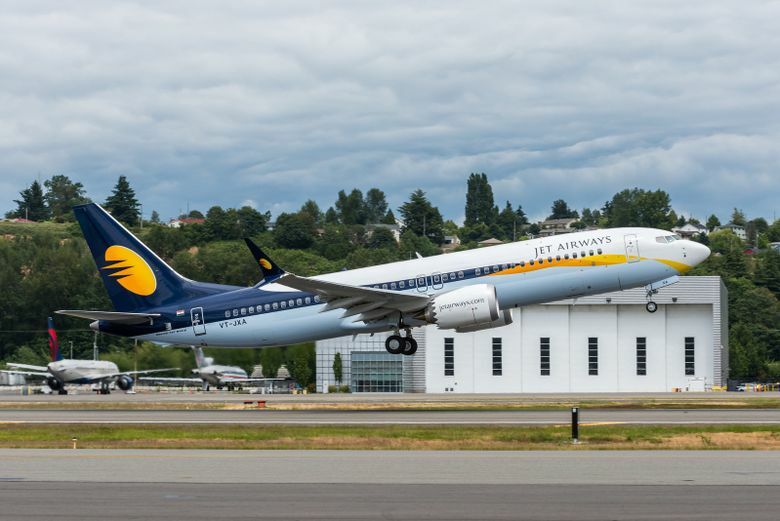 Deputy Chief Executive Officer Amit Agarwal said Jet Airways has regularly met its commitments on loans and is constantly evaluating opportunities to refinance or increase the tenure. The carrier needs as much as $500 million in cash immediately and must refinance $400 million of debt, backed by a guarantor, said Kapil Kaul, South Asia CEO for CAPA Centre for Aviation, adding no one should expect instant results. Jet Airways stock has tumbled 67 percent this year, making it the worst performing airline stock in Asia Pacific amid investor concerns over its outlook. India’s benchmark Sensex index has gained 11 percent. Abu Dhabi-based Etihad, which owns 24 percent of Jet Airways, said it continues to work constructively with its Indian partner. Jet Airways’s rivals are faring no better either. The entire sector has been hit by rising fuel prices, depreciation of the rupee and debt to fund aircraft purchases and rapid growth. IndiGo, operated by InterGlobe Aviation Ltd., posted a 97 percent drop in net profit, its worst-ever quarterly performance. SpiceJet will be reporting earnings next week. Jet Airways said last week that it’s implementing several measures to cut costs and increase revenue, in areas including sales and distribution, payroll and maintenance. The company at the time denied an Economic Times report it had already started firing people and had told some workers to take as much as a 25 percent cut in pay. “The stock will remain under severe pressure till there’s some concrete plan on the table to revive the loss-making airline,” said Devansh Lakhani, a director at Mumbai-based Lakhani Financial Services Ltd.